We offer a framework for organizing the literature regarding the debates revolving around infinite idealizations in science, and a short summary of the contributions to this special issue. Idealizations are ubiquitous in science. They are distortions or abstractions that enter scientific theories, laws, models, or, more generally, representations. Examples include point masses, perfectly rational agents, and isolated populations. Our focus here will be on infinite (and infinitesimal) idealizations in which some parameter takes on an infinite (or infinitesimal) value. For instance, although boiling kettles contain a finite number of particles and a finite volume, it is often claimed that our best scientific theories describe boiling (and other phase transitions) as occurring only in infinite systems: “The existence of a phase transition requires an infinite system. No phase transitions occur in systems with a finite number of degrees of freedom” (Kadanoff 2000, p. 238). Roughly, the notions of “infinite idealizations” and “essential idealizations” are connected to the reduction-emergence debate as follows: Certain effects, phenomena, or properties P are taken to be governed by some lower-level, fundamental theory (or model) L, which faithfully represents P as occurring in systems with some finite parameter or value of a property N. Nevertheless, in order to predict, represent, understand and/or explain P, the infinite idealization in the form of the infinite limit \(N \rightarrow \infty \), in which a new higher-level, non-fundamental theory (or model) H is applicable, is essential and indispensable such that H is not reducible to (e.g., derivable, deducible, or explainable from) L, and P is thus emergent. Are infinite idealizations truly indispensable? If so, what roles are they indispensable for and what types of philosophical commitments do such indispensability claims imply? How do we justify the appeal to infinite idealizations and do such justifications differ from the standard, pragmatic justification given for most idealizations? What explains the success of theories involving infinite idealizations? Do explanatory schemes involving infinite idealizations—for instance, the renormalization group explanation of universality and critical phenomena—signify a novel philosophical account of explanation that differs from standard accounts (e.g., covering law, unificationist, pragmatic, counterfactual, or causal-mechanistic accounts)? If so, are infinite idealizations truly indispensable to such accounts? Must we represent certain phenomena with a mathematical formalism that is most naturally interpreted as appealing to infinite idealizations, or is it always possible either to re-interpret the formalism as not referring to such idealizations, or else to transition to a different formalism that eschews appeals to infinite idealizations? How can actual real-world experiments serve to confirm effects that concern the behavior of systems involving infinite idealizations? And if scientific theories are essentially idealized, how do experiment and observation confirm theories that are literally false? What do systems and objects involving infinite idealizations refer to? What is the appropriate semantics associated with propositions involving claims about infinite idealizations? What, if any, are the implications of infinite idealizations for foundational issues in physics? For instance, do systems with infinite idealizations usually imply indeterministic behavior (e.g., as in Norton’s Dome) or non-local behavior (e.g., as in the Aharonov–Bohm effect)? Do the issues that arise in the context of infinite idealizations in physics also arise in other sciences? For instance, in the context of economics there are also various infinite idealizations that arise, e.g., infinitely divisible goods, a continuum of traders, and consumers optimizing over an infinite time horizon. How should we understand infinite population models in ecology and evolutionary biology, and the infinite extent of languages in linguistics? The papers in this special issue approach these questions and more from various perspectives. They connect with diverse topics that we discuss in Sect. 2 in hope to give some structure to the literature. Section 3 gives a summary of the different contributions and their contents. We will discuss issues related to infinite idealizations as they correspond to four broad topics,1 viz., (i) misrepresentation, (ii) representation, (iii) confirmation, and (iv) realism. For completeness, we should also add (v) intertheoretic relations, wherein issues corresponding to emergence and reduction arise. However, since this topic was already discussed in Sect. 1, we will not comment on it further [but see Palacios (2017, 2018) and Shech (2018b) for recent contributions, as well as the papers by Robertson (Sect. 3.6), Feintzeig (Sect. 3.8), Liu (Sect. 3.10), and Bangu (Sect. 3.11) in this special issue]. Arguably, all idealizations (finite and infinite) involve distortions or misrepresentations. It is in this context that we enquire into the coherency and plausibility of appealing to, strictly speaking, falsities, in order to discover truth. For instance, if idealizations are misrepresentations, how is it that they facilitate true explanations and genuine understanding? One can attempt to make headway on this issue by distinguishing between idealizations (misrepresentations/distortions) and abstractions, which only abstract away from the details and are thus partially true (Jones 2005; Levy 2018), or between idealizations and approximations as inexact descriptions of some target system in the world (Norton 2012). Also, much attention has been paid in particular to the role of idealized and abstracted models in science (Morgan and Morrison 1999; Bokulich 2008; Morrison 2015; Gelfert 2016; Massimi 2018). We may then investigate the epistemic virtues of appealing to multiple models and model-based explanations. The contributions by Strevens (Sect. 3.2), De Bianchi (Sect. 3.3), Fletcher (Sect. 3.4), Valente (Sect. 3.5), Robertson (Sect. 3.6), Wayne (Sect. 3.7), Van Wierst (Sect. 3.9), Liu (Sect. 3.10), Bangu (Sect. 3.11), and Earman (Sect. 3.14) study such issues. If idealizations are misrepresentations of sorts, then they are first and foremost representations, i.e., they have propositional content/meaning, and refer to, denote, or stand in for something. However, it is debatable whether infinite idealizations refer since such idealizations are both not part of the actual world, and their infinitely idealized nature deems them non-actualizable—viz., even if such idealizations where possible according to our best theories, they are impossible from a pragmatic point of view. Relatedly, one may also wonder whether prominent accounts of scientific representation can accommodate infinite idealizations—e.g., see Batterman (2010) and Bueno and French (2018, Ch. 10) for a debate regarding whether the partial structures approach can do justice to infinite idealizations. Similarly, see Shech (2015) for an assessment of the inferential account of Suárez (2004) and the interpretational account Contessa (2007) in the context of infinite idealizations. Some have also looked at the ostensible exploratory role that infinite idealizations play with respect to exploring the representational and modal structure of theories (Shech and Gelfert, forthcoming; Massimi 2018). In addition, it may be the case that by shifting to a different formalism, e.g., constructive mathematics or category theory, we may be able to avoid having to appeal to infinite idealizations and systems altogether. The contributions by Valente (Sect. 3.5), Feintzeig (Sect. 3.8), Van Wierst (Sect. 3.9), Bangu (Sect. 3.11), and Earman (Sect. 3.14) correspond to this topic. A matter of concern in confirmation theory is how we can confirm scientific theories that are literally false. The worry arises already in the context of pedestrian idealizations and abstractions since idealizations act as kinds of auxiliary assumptions that can shield the disconfirmation of the main tenets of a theory. What is especially interesting from our point of view is that such alleged problems become more serious if it turns out that the idealizations involved are indeed indispensable for scientific accounts of physical phenomena as it is claimed in the context of infinite idealizations. Moreover, there is a sense in which essentially idealized “effects,” such as phase transitions and the Aharonov–Bohm effect as typically defined, refer to properties of fictional or abstract systems. We are then led to wonder: how can real-world experiments serve to confirm effects that concern the behavior of systems involving infinite idealizations? Or, said differently: how do experiment lend support to the modal parts of a theory that we cannot test directly, e.g., what some theory says about possible but non-actual infinite systems? The contribution by Earman (Sect. 3.14) in this issue corresponds also to this topic. Topics having to do with misrepresentation, representation, and confirmation usually concern epistemological issues. But there are also metaphysical questions, such as those concerning scientific realism and mathematical platonism, which arise in light of the alleged indispensability of infinite idealizations for explanatory and representational purposes. For instance, if infinite idealizations are explanatorily indispensably to our best scientific theories, are we then rationally committed to existence of such objects? If so, is this view coherent or should it be thought of as a kind of reductio? Alternatively, if infinite idealizations are representationally indispensable to our best scientific theories, does it follow that they faithfully represent some infinite structure in the actual world? This corresponds to the generalization by Shech (2013, p. 1172) of the ostensible paradoxical nature of phase transitions, introduced originally by Callender (2001, p. 549), which we may dub “The Paradox of Infinite Idealizations.”2 The point is that, whether we are talking about representational, explanatory, or predictive indispensability, traditional forms of scientific realism may be committed to the existence of abstract and essentially idealized objects. Other versions, e.g., contextual realism, can perhaps evade such consequences. The contributions by Nefdt (Sect. 3.1), Liu (Sect. 3.10), Bangu (Sect. 3.11), Baron (Sect. 3.12), and Shech (Sect. 3.13) concern topics having to do with scientific realism and mathematical platonism. A perennial concern about idealized models is how they interface with scientific realism. A realist attitude enjoins us to take seriously a scientific theory or model’s representation of the actual structure and nature of the world, yet idealization explicitly confounds the full satisfaction of this demand. Ryan M. Nefdt considers a case less discussed in the philosophy of science literature on idealization and realism, namely a certain prominent assumption in linguistics about the structure of natural languages: they each contain a countably infinite number of distinct expressions. On the one hand, this is the natural consequence of theories, such as Chomsky’s generative grammar (1957), that seek to explain why native speakers of a language can continually generate and understand new sentences they have never uttered or heard before. On the other, it is dubious that our finite minds could really instantiate such infinite structures. Nefdt distinguishes between three grades of increasing representational realist commitment for the linguistic realist, arguing that this tension is only a problem for the latter two grades. On the lowest grade, one only commits to the idea that linguistic theories model speech phenomena, and not mental phenomena, so that the use of infinities in those models need not represent some infinite mental state at all. In his contribution, Michael Strevens aims to characterize a particular class of infinite idealizations, which he calls “asymptotic idealizations.” To do so, he focuses on a topically somewhat different example, the case of population genetics models. Such models collect together and represent different ways that the frequency of genes change in a population during the course of evolution. Aside from natural selection and mutation, there is another evolutionary “force” known as genetic drift, which arises purely from other stochastic aspects of gene transmission, such as the random selection of certain genes (over others) in the progeny of two parents. In many applications of population genetics, however, scientists “set drift to zero”—they idealize away these stochastic effects, apparently in order to facilitate more elegant explanations. They effect this idealization typically by assuming the size of the population is infinitely large, for there is a sense in which for extremely large populations, the effects of drift become negligible. Strevens contends that issues similar to the case of the thermodynamic limit in statistical mechanics apply here, such as whether this zero-drift/infinite-population assumption is essential to the explanatory purposes towards which the models are put, and whether these techniques are best understood as idealizations properly so called or merely approximations. Although an infinite population model cannot be created simply by “setting population to infinity,” there is a way of transforming the finite model into a genuine infinite model. Such a model both corresponds well to population geneticists’ talk, Strevens emphasizes, and provides a better of explanation of the target phenomenon than the non-idealized model from which it is derived. It may seem at first obvious that infinite idealizations, qua idealizations, introduce gross distortion of a phenomena into a model representing it. However, Silvia De Bianchi claims that civil engineers employ infinite idealizations in the computational structural analysis of buildings to improve their predictive accuracy. Although it may seem paradoxical that introducing distortion restores order in engineering, De Bianchi shows how this arises from the particularities of the methods engineers use. Civil engineering in particular is concerned with the mechanics, stability, and functioning of continua, including beams that keep roofs and bridges aloft, and foundations that keep buildings level on the ground. These continua are best described by complicated differential equations, complicated enough that there is rarely, if ever, any hope of deriving an analytical solution to an engineering problem. Rather, to test which designs are optimal under expected conditions, civil engineers build digital models of those designs that are discretized: smoothly deformable continua are approximated by a large number of discrete elements. This turns completely intractable differential equations into more tractable algebraic finite difference equations. But doing this accurately requires an enormous number of finite elements, enough that they can open the floodgates to all sorts of errors introduced at the computational level. Amazingly, clever use of partially infinite elements can substantially reduce the number of needed finite elements and control numerical error propagation. De Bianchi’s paper explains how this works in detail. A minimal model is an idealized model that functions better for explanation and understanding than a less idealized version because it simplifies or abstracts away details that are irrelevant for that explanation or understanding (Batterman 2002a). But some putative minimal models have properties that make them no longer models of the theory from which they derive. To clarify such cases, Samuel C. Fletcher’s note combines the concepts of minimal models and approximation (Norton 2012) to arrive at the notion of a minimal approximation: an inexact description of a quantity or property of a model that functions better for explanation and understanding than a more exact version, without itself being a full model. Minimal approximations thus show that the strategy of minimality, in the service of better understanding and explanation, can be applied fruitfully to parts of models, avoiding problems that some seemingly inconsistent minimal models might have. To illustrate, he considers the case of Norton’s Dome (2008), and the charge by Laraudogoitia (2013) that Norton’s original analysis of the dome system’s failure of determinism involves such an inconsistent model within Newtonian mechanics with gravitation. This opens the question as to whether this inconsistency is somehow responsible for indeterminism in this case. Fletcher shows that Norton’s original analysis can be vindicated once it is understood as a minimal approximation, one that is ultimately not essential to the presence of indeterminism. Reversible processes in thermodynamics have paradoxical properties. On the one hand, orthodox thermodynamics is supposed to concern itself with systems in equilibrium, systems whose observable quantities remain constant. On the other, a central explanatory and predictive technique of the theory involves describing particular continual changes in a system’s state that can equally well proceed in reverse. Such reversible processes thus involve the changing of states that by definition do not change over time! This is why Norton (2016) has dubbed them “impossible processes,” whose “fog of paradox” he attempts to dispel by re-describing them as tools for the approximation of non-equilibrium processes, rather than thermodynamically viable idealizations thereof. In his contribution, Giovanni Valente rehabilitates a proposal by Ehrenfest-Afanassjeva (1956) to resolve the problem in another way. This proposal first distinguishes between “quasi-processes” and “quasi-static processes,” the former naming the usual equilibrium curves to emphasize that they are not true processes, and the latter naming a sequence of equilibrium states that mathematically approximate a quasi-process. Quasi-static processes can be realized by real processes that involve sufficiently small departures away from equilibrium in between regaining equilibrium. To what extent can the constituent stars of certain galaxies, especially those with little interstellar dust, be modeled like particles in a gas? On the one hand, at the time scales relevant for galactic dynamics, they are effectively stable corpuscles over time and their inertial paths are deflected through inter-corpuscular forces. On the other, the nature of these forces is long-range and always attractive, unlike those for typical gases. These differences thus raise questions for the applicability of statistical mechanical and thermodynamic concepts to so-called self-gravitating systems such as these. Katie Robertson argues that statistical mechanics nonetheless applies quite well, and has delivered scientific success purchased from the application of probabilistic concepts. But, this application yields theoretical models for these galaxies that have no thermodynamic limit—an idealization of a statistical mechanical system as having infinitely many constituents—hence do not in any substantive sense fall under the purview of thermodynamics. How do the capacities of very different types of models for phenomena compare, if they make the same predictions in the end? Andrew Wayne considers the case of gravitational wave models that use point-particle idealizations. These idealizations are more problematic in general relativity than in Newtonian gravitation because point particles are much less plausibly genuine possibilities in the former—Wayne contends that they are in fact impossible. He observes that this would undermine their explanatory power if one could not also show that their idealization is dispensable, for that power is supposed to derive from a consistent and well-confirmed scientific theory, namely, the theory of relativity. This allows him to contrast two distinct uses of the point-particle idealization. One involves so-called post-Newtonian methods, which are a suite of techniques that approximate certain predictions from the general theory of relativity in terms of power series of Newtonian quantities—think of how the Taylor expansion of an analytic function allows one to approximate the function using a polynomial within a particular subset of its domain. The other, newer one draws from the techniques of effective field theory—in particular, renormalization—developed originally in condensed matter physics and extended in high-energy particle physics. Although both ultimately and amazingly yield the same predictions, Wayne argues that only the former can plausibly explain gravitational wave behavior. This is because the use of post-Newtonian methods only use the point-particle approximation as a useful simplification that could be eliminated—and has been partially eliminated—by normal development of the methods, whereas effective field theory methods, arising originally from applications to particulate phenomena, essentially presuppose the point-like nature of the sources of gravitational radiation. Traditional accounts of reduction tell us that a theory reduces to another if the former can be deduced from, or contains no more information than, the later. But is this condition satisfied in cases in which “the reducing theory” involves infinite idealized systems whereas the “reduced theory” describes only finite systems? In other words, can the behavior of infinite limiting systems be deduced from the behavior of finite systems? Benjamin Feintzeig uses the tools of category theory to illustrate that infinite models in statistical physics, in particular models that account for total magnetization, contain no more information or structure than finite models. To make this point, he uses the mathematical language of operator algebras to show that the (bounded) completion of a C*-algebra in the weak topology is unique and, in a sense, fully determined by the algebra. According to him, this demonstrates an important sense in which the properties of infinite systems are fully determined by the physics of finite systems. He concludes the paper by considering possible objections to his proposal and by suggesting avenues for future investigation. When we use infinite systems to explain the behavior of finite target systems, we are distorting an aspect of reality in our scientific models. How can we make these kinds of idealizations compatible with scientific realism, which is in general committed to the idea that scientific theories are true or at least approximately true? Liu suggests a solution to this compatibility problem by endorsing a form of contextual realism, according to which truth is not independent of any epistemic or philosophical conception, but rather it is connected to anchoring assumptions that “insulate parts or levels of reality so as to secure reasons for believing of certain objects as real or existing that would otherwise not be believable”. Important in this view is that anchoring assumptions are not determined by mere convention or convenience of practice. Instead it is reality itself that makes them possible. In the case of phase transitions, so argues Liu, the thermodynamic limit functions as an anchoring assumption that insulates the context in which these phenomena can be correctly described as singularities. In this particular context and not in others, phase transitions understood as singularities of infinite systems are a real thing, in the same way as dogs and cats are real things in a certain context, but not in others. In recent years, phase transitions have motivated an important debate in philosophy of science, where some philosophers—so-called “Referentialists”—have affirmed that the discontinuities and singularities that characterize these phenomena do refer to properties of real thermal systems, whereas others—so-called “Non-Referentialists”—have taken the opposite view. How can we explain this disagreement? Sorin Bangu asserts that the source of this discord is a misunderstanding of technical terms involved in the physics of phase transitions. In particular, so argues Bangu, philosophers have failed to distinguish between three related but different notions: the discontinuity of a thermodynamical parameter, the singularity of a thermodynamic potential, and the idea of an infinite system. After giving a careful explanation of these three notions, Bangu concludes that discontinuities are “trivially real” and therefore do not pose any problem for the Referentialist position. More problematic for the Referentialist is the notion of singularities, i.e., “the mathematical representation of the physical discontinuity in the formalism of the free energies”, because it is this notion that requires the introduction of an infinite system. Nonetheless, Bangu argues that even in this case, one can defend a weak form of Referentialism, in which singularities are not assumed to refer to a property of the physical systems but rather to “clusters of states, or regions in the graph collecting measurement data”. Recently, it has been argued that infinite idealizations are indispensable to the explanation of certain phenomena, meaning that the removal of the idealization undermines the explanation. As a consequence, it has been said that one ought to accept the truth of those idealized claims. The problem is that in cases like phase transitions, this leads to a contradiction with our most successful background theories such as the atomic theory of matter and general relativity. How can one solve this paradox? Baron suggests a solution that lies on a distinction between constructive and substantive indispensability. A claim is constructively indispensable to our current best scientific theories if there are reasons to suspect that it can be substantively dispensed with, even if “there is no explanation available that eschews the claim in question”. In contrast, a claim is substantively indispensable to our best scientific theories if there is no reason to suppose that the claim can be dispensed with. Cases such as phase transitions—in which the thermodynamic limit appears to be indispensable—are, for Baron, only constructively indispensable. What gives us a reason to believe that this idealization is substantively dispensable? According to Baron, that it fails to cohere (or be consistent) with the underlying framework constituted by our background theories. Failure of coherence functions then as a criterion for constructive indispensability. Baron argues that if an idealization is constructively indispensable, then we do not have to believe that it is literally true, so the paradox of infinite idealizations does not arise. Elay Shech discusses the possibility of indispensable idealizations but in connection to a recent debate on nominalism that has taken place in philosophy of mathematics. Defenders of the “easy road” to nominalism have argued that it is possible to accept the thesis that mathematical entities are indispensable to our best scientific theories without having to commit ourselves to the existence of such mathematical objects. In his contribution to this issue, Shech challenges this view by pointing out that it relies on a condition of “approximate instantiation” that fails to be satisfied in the case of essential idealizations. To make this point, Shech suggests to identify the notion of “approximate instantiation” with Norton’s notion of approximation (2012), according to which there is an approximation just in case there is a “match between the relevant properties of the limit system (using to represent/model the target system) and the corresponding limit properties”. Cases of essential idealizations such as the assumption of two dimensions in the account of fractional quantum statistics fail to provide an approximation of real physical systems in the sense described above and therefore cannot be understood as a mathematical structure being approximately instantiated by a physical system. In light of this result, one has, according to Shech, two options left: either one embraces ontological commitment to the mathematical structure involved in those explanations or endorse the “hard road” to nominalism, which denies the indispensability of such mathematical objects. How can experiments on real systems serve to confirm the predictions of a theory that concerns the behavior of a fictional system? The usual explanation found in the literature is that actual laboratory conditions are “sufficiently close” to those that characterize the fictional system. But is this always the case? In his contribution to this issue, John Earman addresses this question focusing on the Aharonov-Bohm (AB) effect, which involves a set of idealizations such as the assumption of an infinitely long solenoid with other fictional attributes. Earman argues that in contrast to standard accounts on idealizations, the “idealizations” involved in the AB effect should not be understood as distorted descriptions of real systems found in the world, but rather as “accurate and precise descriptions” of a target fictional system that is not realized in the actual world. According to him, this different use of idealizations increases the conceptual and mathematical challenges surrounding the AB effect and encourages us to pay careful attention to certain aspects of the effect that are generally neglected in the literature, for instance that the observables are not local and that the idealizations responsible for the AB affect are also responsible for the unitarily inequivalent representations of the canonical commutation relations that emerge in the limit of a series of actual world systems. Essentialists claim that idealizations play a substantive role in science in the sense that they are essential or indispensable for scientific accounts (i.e., explanation, understanding, representation, prediction) of certain physical phenomena, while dispensabilists maintain that idealizations play no substantive role in science and are dispensable from mature scientific theory. Concrete systems include a concrete attribute (or property) A. Concrete systems display a concrete phenomenon (or behavior) P.
P is scientifically-mathematically represented by (perhaps some structure) \(P'\). \(P'\) can only arise by appealing to an idealizing limit I. A system in the idealizing limit I includes an attribute \(A'\) such that \(A \ne A'\). \(P'\) faithfully represents P (and so imputes attribute \(A'\) to P). ES was the primary author of Sects. 1 and 2; SCF and PP were the primary authors of Sect. 3 and provided edits of all sections. ES would like to thank Robert Batterman, John Earman, and John Norton. All authors thank the contributors to this special issue and the partipants of the Munich Center for Mathematical Philosophy’s June, 2016 conference on the same topic. SCF acknowledges partial support from a Marie Curie Fellowship (PIIF-GA-2013-628533). Levy, A. (2018). Idealization and abstraction: Refining the distinction. 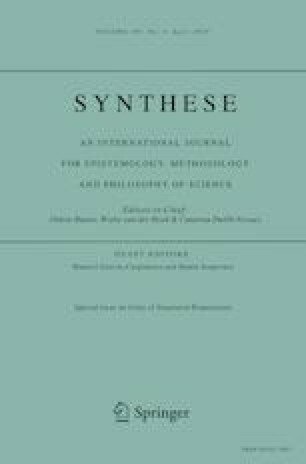 Synthese, forthcoming. https://doi.org/10.1007/s11229-018-1721-z. Palacios, P. (2017). Phase transitions: A challenge for reductionism? http://philsci-archive.pitt.edu/13522/ (unpublished manuscript). Shech, E. (2018b). Philosophical issues concerning phase transitions and anyons: Emergence, reduction, and explanatory fictions. Erkenntnis, forthcoming. https://doi.org/10.1007/s10670-018-9973-z. Shech, E., & Gelfert, A. (Forthcoming). The exploratory role of models and idealizations. Forthcoming in Studia Metodologiczne. Preprint. http://philsci-archive.pitt.edu/13338/ (unpublished manuscript).